Inland Packaging has been selected by the Gravure Association of the Americas as a Best of the Best Golden Cylinder Award winner for their Leinenkugel’s Summer Shandy cut and stack label. Winners were announced at the Gravure Technical Forum in Cincinnati, OH on October 10th. Winning entries were chosen by a panel of judges consisting of experts in the gravure industry. These judges spent two days judging the industry’s best offerings and products. 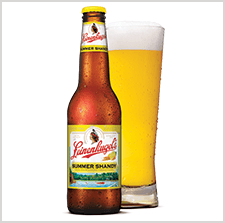 The Summer Shandy label was chosen for meeting or exceeding standards in the packaging and label paper substrate category. Inland’s modern-day gravure equipment has a tighter print registration tolerance than ever before, allowing for this complex color build in the graphics which stood out to the judges. The Golden Cylinder Awards are conducted by the Gravure Association of the Americas (GAA) to promote the gravure process and to provide peer recognition for technical achievement. The competition is designed to identify the “best of the best” in each segment of the industry and to distinguish technical innovations.